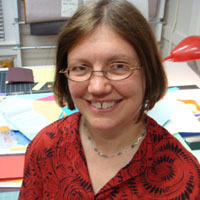 Carol Barton, the Pop-up Queen, is interviewed by Steve Miller on July 15, 2009 at the Wells Book Arts Summer Institute, where she taught Paper Engineering and Sculptural Books. She reveals the secrets of the US Patent Office. She is the author of The Poc.